Because the security gates were down, we were unable to gather any additional information on this place but for its name, "Internet Coffee House," which we assume will sell coffee and internet. It may not be open yet, or it may just not be open on Sundays (which would be strange). Could this place be competition for K-Dog? That will ultimately depend on whether Internet Coffee House can offer a quality product. We enjoy K-Dog and cannot see ourselves becoming disloyal unless ICH offers something really stellar. Anyone know anything about ICH? Check it out on Parkside between Flatbush and Ocean. I saw it with the gates halfway open yesterday, and it didn't look close to being ready for business. I heard ICH(Internet coffee house) is going to be great hey I go to college and I will go there all the time I heard it is going to have place to go on the internet, a place to do work and a place to chill/lay back. Hey everyone you should try it they sound good. My friend who lives across the street said the guy that lives their said the owner is going to open around New Years. Try it! Rumors have it that ICH is going to be a high-end establishment. That remains to be seen however. The neighborhood can use a good coffee house, no pun intended. Does anyone know when it will open? I heard rumors about ICH(Internet Cafe House) will the bomb on Parkside. I heard from friends that there will be some form of drama each night, and they will be serving some brand name coffee. People let's wait and see what is hidden behind those close gates. I hope when the gates are pull up there would not be any suprises. Does anyone knows alittle more about this place Internet Coffee House on Parkside next to Exquisite Restaurant? Well so far I heard they will be opening sometime late December or early in the New Year, and I also heard it will be a hot spot with activities all week, I think that will be so cool for Parkside. I also heard that people who have talent could go there for exposure. Whatever, so let's wait and see if that is really going to happen. 1. I don't know much about K-dog....when ICH opens; I hope it will make k-dog look like pub. 2. As to the drama, I hope it will be good drama. They should have a movie night and an open mike. I have some talent. I do comedy. If someone would provide me information, I like to make an appearance. I don’t understand what the hoopla is all about. So big deal it is going to have brand name coffee. Definitely, it isn’t going to be no Starbucks. Oh...do they have a website. Does anyone know when this place will be opened. rumors has it that it will be better than the internet cafe next to mcdonald and more comfortable seating for customers. i heard from someone who works there that they will have the best coffee on Parkside and entertainment all week. I also heard that they are looking for good singers, there will be movie night, groups discussion and even open mike night. I got all this from the main source, so let's prepare and wait to see what is coming to Parkside. Come the heck on. 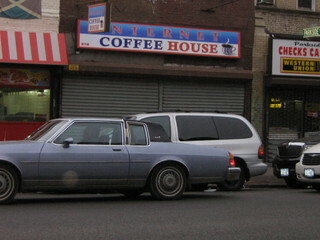 A place called "Internet Coffee House" is trying to compete with K-Dog? I mean, not that I'm biased or anything, but they wish. And I smell a shill or two over here as well. For shame! What is so unique about k-dog? The more the competition the better. If ICH is going to have good coffee, relaxed atmosphere and live entertainment, that should not be a threat to k-dog. Hey the more the better. I think there is plenty for k-dog and ICH. Let us pick and choose. I am a student at MECC and I think that we need such a place. I hear that there will be some Spanish performers. I speak Spanish I do not see enough stuff for the Latinos in the area. Let's judge the place after it is opened. I look forward to something besides phone cards and 99 cent stores. I never heard of K dog what kind of a name is that? I thought it was a pet store. I will check it out this week. I am interested in checking out the photography at K-dog. I like to take pictures of our neighborhood - Parade Grounds and the beautiful park were my dad used to work. I think we are surrounded by great community stuff. We need more stuff for the kids. I am studying at MECC to be a teacher and I would suggest kid friendly activities - does K-dog do this? I have a two year old and a teen. Remember how much fun Universoul circus is - when they come to town! I, for one, am very excited about this place opening up. I've lived at 305 Ocean for about 10 years and think the neighborhood has incredible promise. Every step in the right direction is appreciated. all i could see was the floor, but it looks really bad. some kind of cheap white tile. Everyone should stop criticizing ICH until the gates open up to everyone. so until that stop the trash talking. Suspicious writes that she saw white tiles and they look "really bad." I looked. They are not white. I like it. Can we all just meet there and look so we can come to an agreement. I had a chance to look at ICH yesterday. The windows were up. They were putting a new gate. The place looks nice. I asked and was told it will open for business on January 18th. See everyone there. I am going to be there in the afternoon. The neighborhood can sure use a good coffee place. Does anyone have more information? Can the moderator of this blog take more pictures of the inside? I heard that the grand opening is Saturday, January 19, 2008. Some one said a flyer is going around detailing the day’s event. I looked inside tonight and saw those cold generic ceramic tiles,bright lighting, flatscreen tv. It looks inviting but not like a place you would stay at too long. I prefer a place with couches and used furniture that seems homey. If they can make a good chai late with soy, I'm good. But my guess is they would be using a syrup or powder rather than tea leaves or even a tea bag. And what are the chances of goods baked on the premises with a name like internet cafe. Well those are my predictions I guess we'll see. ICH has very high class taste with everything. I saw the flat-screen and I saw the light and I don't mean heaven. I went in as a costumer and ordered a coffee and I didn't know did the worker make this or a coffee angel??? Heck, I might even sell my house to move in to ICH. All I hope now is that I don't go bankrupt spending all my money on their food and entertainment costs. I love you ICH woooooooo!!!! you guys are comedians very funny "I love ICH woooo" funny! obviously these people don't know class when they see it! Anyway i happen to like ICH i think it's a cool name a nice look in brooklyn something new in the beginning of the year. The people there are very hospitable, kind and helpful and how do i know well you would never know unless you get the experience for yourself. ICH would be the new local starbucks. It is slated to attract the new well established professional residents. Featuring high end coffee, internet access, conference/meeting space and more importantly, you can purchase your early morning cafe jolt on your way to the subway or bus. CLEAN, SPACIOUS, FRIENDLY AND ACCOMODATING. This joint will function just like Starbucks on 57th Street in Manhattan. Picture it! Flavoured Coffee, TV and the day's New York Times with internet access or laptop capability. Looks like Parkside would be the next Central Park!